While Strickland Vintage Watches has been fortunate to be known for a variety of unusual vintage watch genres, we seem to be inextricably linked to rare military horology. We're delighted for a variety of reasons: The mechanisms of War – those timepieces specifically designed and built for combat - are of the highest order. So were the men and women who used them. We're particularly fond of WWI era examples, as they constitute the first true generally accepted wrist watch. Prior to The Great War, wristwatches were, well, for women. On July 28, 1914, that changed. These pieces, with their horsehide straps and sterling buckles, wire lugs and pumpkin crowns, are handsome and rugged and more interesting than anything produced today. And, if you're reading this, you're fortunate enough to have the good taste to know that. Occasionally, even those of us who thought we'd seen all the early variants of the "wristlet" watch are pleasantly surprised. This stunning work of wrist art is such a surprise. 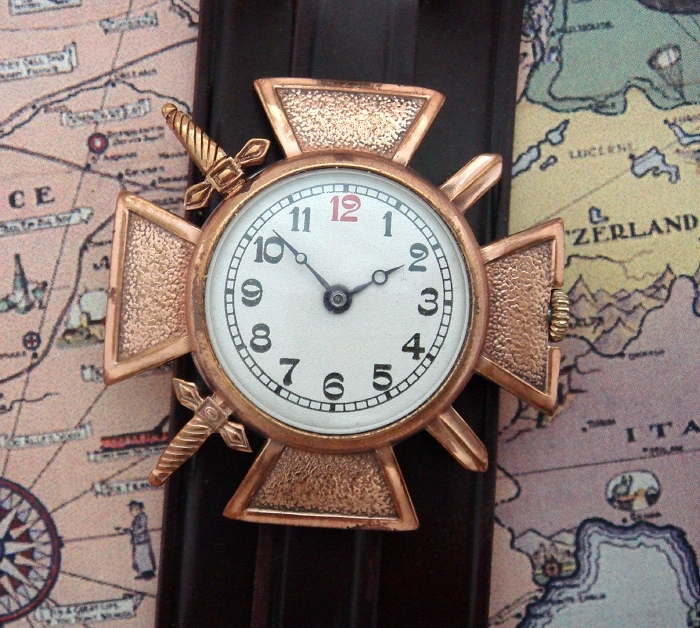 Known as the "Croix de Guerre" watch, it is one of a few known to exist. The significance of the Croix de Guerre medal of valor is well established: Soon after the outbreak of World War I, French military officials felt that a new military award had to be created. At that time, the "Citation du jour" consisted of a sheet of paper. Somehow that didn't seem to fit the scope of The Great War. On Dec. 23, 1914, the French deputy Georges Bonnefous, along with 66 other military deputies, proposed a legislative bill to create the "Croix de la Valeur Militaire" ("Cross of the Military Valor"). On 18 Jan. 1915, the award was sanctioned, but the name of the military award was renamed the Croix de guerre ("Cross of War"). Today is now known as "Croix de Guerre/1914-1918". Designed by the sculptor, Paul-Albert Bartholome, the ribboned medal is approximately 37 mm across featuring four arms and two crossed swords. The center displays the symbolic profile of the French Republic: a young woman wearing a Phrygian Cap. For reasons lost to history, bronze wristwatches in the shape of the Croix de Guerre were commissioned. Were they awarded to actual medal recipients? Were they worn by those who petitioned to create the award? Or were they worn in support of the war effort? These were not medals converted to watches; these were watches specifically sculpted and created in the likeness of the medal, right down to 10mm flexible lugs on the back of the frame. Fitted with high-grade Swiss movements and designed to be worn on two-piece leather or horsehide straps, they were – and are – magnificent works of wrist art! This example came from the estate of someone who was said to have received the watch during WWI. We purchased it from the great niece of the original owner. We have taken great pains to restore the piece to its original condition, from dial to cleaned, oiled and calibrated movement. Also, we have taken the liberty of fitting the piece with a two-piece cordovan strap of the type that might have been worn originally with the timepiece. Please take a few moments to view the images of the piece, as it is both a rare and stunning work of historic wrist art! We've done as much historical research on this timepiece as anyone and welcome any information surrounding the watch and its origins. Also, we have the name of the original owner of the piece: It will be provided to the purchaser for provenance and to facilitate additional research.